Now, I can tell you, anecdotally, that my features on big hubs such as ChildhoodUnplugged and CandidChildhood have come from using the lesser-used theme tags. 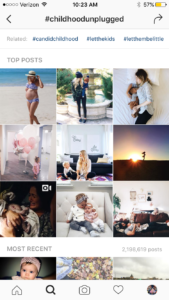 I feel like…I could be wrong….but the features that come from the main tag are ones that end up in Top Nine – these are the ones that get the most engagement within the first hour or so of posting. In order to hit Top Nine for a big hub, you’re probably gonna need to be an account with a heckuva lotta followers. Highly engaged followers. The reason that the Top Nine get featured more often on those big hubs is because those tags are used SO MUCH that within only a few minutes, the “most recent” pictures get buried! And I do believe there’s some correlation between the really good pictures and the most engagement. There’s a reason Megan Loeks has a billion engaged followers. Her work is really, really good. 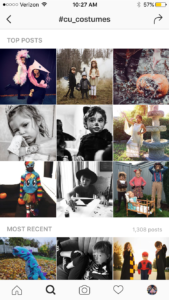 But, to get to Top Nine in the theme tag – now, that I’ve been able to accomplish many times. Now – the screenshots shown here are a bit misleading, as the over 2 million tags to the ChildhoodUnplugged main tag are cumulative- it’s not just those tagged within the last week. The theme tag #cu_costumes were clearly only those posts tagged within the last week. So, therefore, I shall endeavor to track main vs. theme tags for the following hubs, @ChildhoodUnplugged, @CandidChildhood, @CameraMama and @OurCandidLife. I’ll track each hub Monday-Friday. We already know that maintags get far more traffic than theme tags, but just for fun, let’s quantify it. I’ll report back next week with my findings. You are so cool! I don’t suppose I’ve truly read something like this before. So wonderful to discover somebody with a few original thoughts on this subject matter. Really.. thanks for starting this up. This website is something that is required on the internet, someone with a little originality!